Beautiful Lake Champlain, in Burlington. Think Vermont and images of verdant mountains, covered bridges and outdoor sports most likely come to mind, as does the state’s well-known embrace of progressive politics. ​In Vermont, the least religiously affiliated state in the union, the pace and attitudes are relaxed. One Jewish congregation uses Lake Champlain as a mikvah and hosts the occasional Rock Shabbat featuring its house band; another celebrates Rosh Hashanah with a tashlich ceremony in kayaks. ​Burlington, rising on a slope above the lake, is a college town as well as Vermont’s largest city. It is also a place of migrants and resettlement, including the late-19th-century Jewish settlers who created its Little Jerusalem neighborhood. In recent decades, Soviet Jews as well as Bosnian and Somali refugees have found a home here. 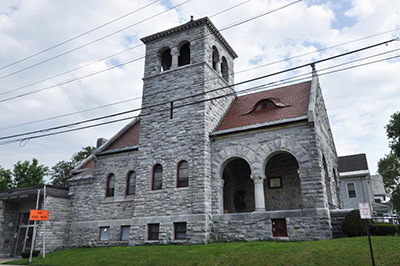 This congregation came to an end in the 1890s, and the Rutland Jewish congregation, founded in 1910 and originally called Adath Israel Congregation, became the focus of Jewish life in that area. In 1927, the Rutland congregation bought the private Baxter Memorial Library to use as a house of worship and changed its name to the Rutland Jewish Center. ​Meanwhile, Burlington’s first minyan, which started in the 1880s, consisted of peddlers who met in the shop of a French-Canadian cabinetmaker in the old North End, according to a PBS documentary on the city’s Jewish history. Many of the peddlers started their own businesses, which included selling groceries, dry goods, candy, clothing and furniture. Eventually, Burlington Jews established three neighborhood synagogues. Burlington, in northwestern Vermont, is about 45 miles south of the Canadian border. In the city’s North End, the area around the original Ohavi Zedek Synagogue building was called Little Jerusalem for its resemblance to Kovno, Lithuania, the ancestral home of most local Jews. ​The original building, erected in 1885, is a gabled brick structure at 168 Archibald Street; it is the oldest-known synagogue building in Vermont. Inside, wooden pews surround the central bimah, and the wall curving behind the Ark is reminiscent of the Western Wall. Today, this is the home of Ahavath Gerim, a Conservative congregation that has monthly Sabbath services and a mikvah. Multiple sources provide different years for the split, but in either 1889 or 1910, an Orthodox group broke away from Ohavi Zedek and founded Chai Adam Synagogue. Chai Adam hired Ben Zion Black, a Jewish artist from Lithuania, to paint in its new home a mural in the style of what would have been found in Eastern Europe’s wooden synagogues. ​Chai Adam ultimately gave up its building when it remerged with Ohavi Zedek in 1939. The mural was abandoned and largely destroyed, but the part over the Ark was protected by a wall. In 2015, the remaining section was moved to Ohavi Zedek’s current home, where it now graces the lobby. 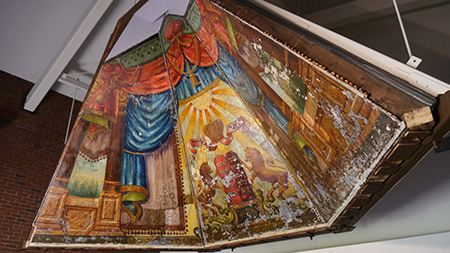 Said to be rare in the United States, the mural, which has been partly preserved but awaits complete restoration, depicts the Ten Commandments flanked by lions, topped by a crown and surrounded by colorful draping. 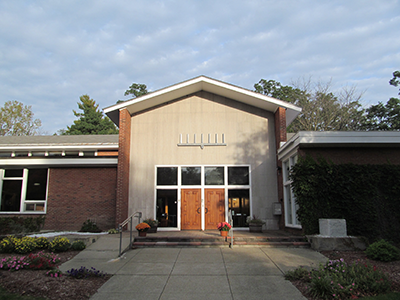 Temple Sinai in South Burlington was founded in 1966 as the first Reform synagogue in Vermont. It built its own home in 1985 (500 Swift Street) after 20 years of meeting in congregants’ houses and rented rooms. Today, it has some 180 families, a religious school and worship services that range from the traditional to ones that include folk music and rock. ​The Ark features a colorful patchwork cover. An 18th-century Czech Torah scroll, looted by the Nazis and on permanent loan from the Memorial Scrolls Trust in London, is displayed in a glass case near the synagogue’s Holocaust Victims and Survivors Meditation Chapel. Gov. 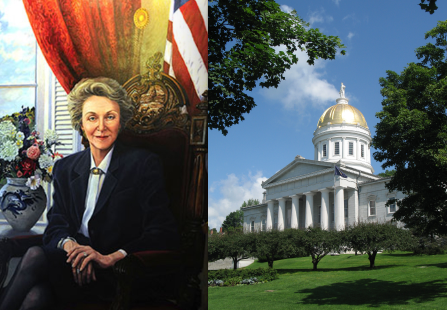 Madeleine May Kunin’s portrait hangs in the Vermont Statehouse. Vermont’s capital, Montpelier, is 35 miles southeast of Burlington. The golden-domed Greek revival statehouse seems particularly grand because it is set far back from the street against wooded hills (115 State Street). ​Don’t miss the portrait of Swiss-born Madeleine May Kunin, Vermont’s first and only female governor, first Jewish governor and the first Jewish woman to be elected governor in the United States. A feminist who served three terms, she hired women for many roles in her administration. Later, as the United States ambassador to Switzerland and Liechtenstein, Kunin influenced the creation of the Swiss banks’ $1.7 billion compensation fund for Holocaust survivors and their heirs. At 83, she remains active in public life; Kunin chairs the Friends of the Lost Shul Mural project and is a James Marshall professor-at-large at the University of Vermont. ​Also worth a visit is the Vermont History Museum, next door to the statehouse. Beth Jacob Synagogue, founded in 1913, was Orthodox until World War II. Today, it describes itself as unaffiliated, Reformadox and lay led (except on the High Holidays), with 90 families. ​The beige wooden building, formerly a private home, boasts a recently renovated interior and a new extension. The congregation’s officers speak passionately and humorously as they recount that the modest wooden Ark, from the once-active Jewish community in nearby Barre, had two mysterious hooks on it. In Barre, the story goes, the minyan met in a furniture warehouse. The hooks held up a curtain with which the men covered the Ark during their weekly poker game. The college town of Middlebury, 35 miles south of Burlington, has had a Jewish presence since the 19th century. The Lazarus family, which owned a department store, would host Jewish students in their home. In the 1970s, Eugene Lazarus donated the house—a two-story white wooden building—to the nondenominational Havurah-The Addison County Jewish Congregation, which preserved the original mezuzot. The congregation runs a growing Hebrew school. Stowe, with its covered bridges, crafts shops and the flavor of a country town, is 35 miles east of Burlington, and one can stop en route at the Ben & Jerry’s factory for a tour. Ben & Jerry’s was founded in Burlington by Ben Cohen and Jerry Greenfield in the 1970s but is now owned by Unilever. Rutland, 87 miles south of Stowe and home to one synagogue, the Rutland Jewish Center, still has Jewish-owned businesses, including Godnicks Grand Furniture, Rutland Pharmacy, Tom Cohen’s Carpet Warehouse and Sensible Shoe. ​The rabbi of the Conservative congregation, Doug Weber, is a university professor who plays the tuba and euphonium. The congregation itself is housed in the most architecturally interesting synagogue building in Vermont. The Romanesque gray marble building was formerly the Baxter Memorial Library. ​ The congregation has produced a cookbook, Kosher Yankee Centennial: 100 Years of Jewish Cooking in Vermont. Brattleboro, in southwestern Vermont on the New Hampshire border, has a thriving arts scene, including the Brattleboro Museum & Art Center located in the former railway station at the foot of Main Street. The painter Wolf Kahn and his wife, Emily Mason, are honorary trustees. ​Nearby is Sam’s Urban Outfitters (74 Main Street), founded in 1932 as Sam’s Army & Navy by Sam Borofsky and still family-owned. ​Shir Heharim-the Brattleboro Area Jewish Community, a Reform congregation, has an active Facebook presence and is situated in a 100-year-old farmhouse. Congregational activities include crafting useful items for the homeless. ​Brattleboro is also home to Chabad of Southern Vermont, headed by Rabbi Avremy Raskin, whose Vermont family roots date to 1919. Chabad has several branches throughout the state. Fine crafts abound throughout the state and make shopping for souvenirs particularly worthwhile; see the Vermont Crafts Council’s list of galleries and shops. Bennington Potters has long been Vermont’s best-known producer of handmade stoneware. Its shops, in Bennington and Burlington, also offer home accessories, furniture and art. At Potters Yard (324 County Street in Bennington), take a factory tour to see how the pottery is made or begin a walking tour of downtown Bennington’s historic pottery sites. There are no kosher restaurants in the state, but visitors to Burlington can enjoy catered Shabbat meals from Vermont Kosher, which also operates a kosher kitchen on the University of Vermont campus. Creative vegan and vegetarian meals can be had at Zabby & Elf’s Stone Soup in Burlington. In addition to its non-meat dishes, the restaurant offers Jewish-inspired (nonkosher) cuisine, including challah, chicken soup and brisket. The eclectic dinner menu of Kismet in Montpelier includes vegetarian and fish dishes. In Brattleboro, the Superfresh! Organic Café offers an unusual mix of vegetarian and vegan fare; try the oven-baked pancakes. For information about the Sara Frank Chapter of Hadassah, which was founded in 1941 in Burlington, has over 400 members and covers the entire state, contact Linda Kopper. The nondenominational Jewish Communities of Vermont, founded in 2013 by Susan Leff, is an initiative seeking to identify and unite under one umbrella all available Jewish resources. Esther Hecht is a journalist and travel writer based in Jerusalem. Sadly that cemetery in Poultney is in rough shape. There is also a vibrant Jewish Community in Manchester VT.
I’m disappointed that in an article about Jewish sites, the lovely 100-year old synagogue in Bennington, Congregation Beth El, was not mentioned, while Bennington Potters was. Surprised that more was not written on Chabad in Vermont, specifically Burlington. Burlington is home to very active Chabad community center with a preschool, hebrew school, summer camp and many programs throughout the year. Very timely! My granddaughter that is a vegan will be attending University of Vermont this year and I emailed my son the article with the list of vegan restaurants. We retired to Florida and like to be connected to our children/grandchildren still living up north. Thanks! I was born in Granville, NY and heard stories of the Poultney Cemetery. My father and Grandfather were very active in the small Granville congregation. My father had the honor of keeping the torahs in our house for the High Holy Days (which were conducted in the Grange Hall). There is an interesting history of Jewish peddlers in Vermont. My Grandfather was one but I wish I knew more about them. Here is the link to an article by Prof. Robert Schine. Starting on page 3 he describes the lives of the early peddlers.